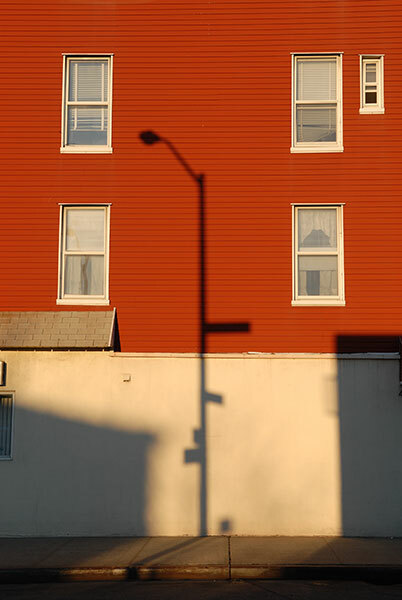 I don’t usually think of my urban landscape photos as Fine Art Photography. They’re just visual impressions, casually collected by technological means. 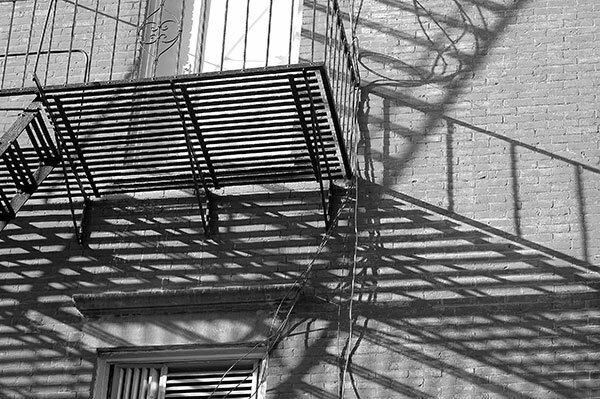 Unless it’s a job, I rarely go out specifically to make photographs. If I’m going to the kind of event I think will attract a lot of shutterbugs, I’ll deliberately leave my camera at home. 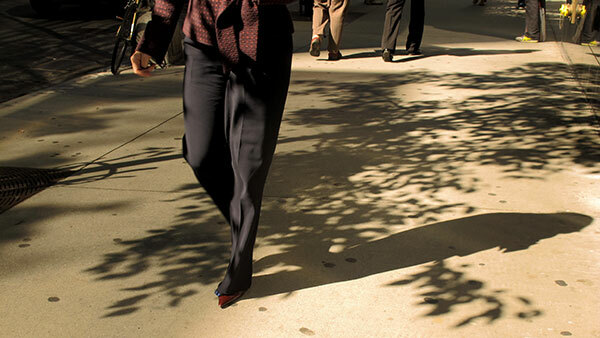 But when I’m going about my business around town, provided I’m not too rushed or carrying too much other stuff, I often carry a camera with me. 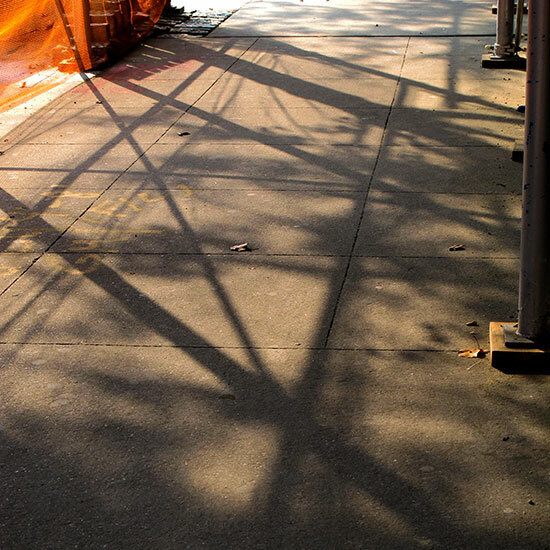 Looking for pictures in the world around me is an exercise in seeing the world abstractly. I like patterns and geometry, randomness (chaos) and design (order), elemental and optical phenomena. 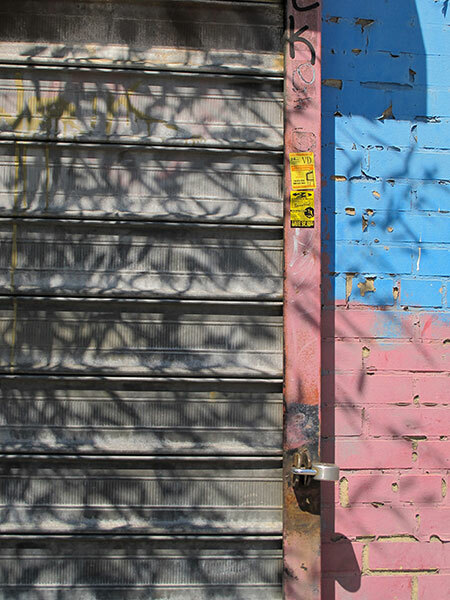 Sometimes the patterns of shadows and light, when framed in the viewfinder, look like abstract expressionist paintings, especially when organic scatterings come together with rectilinear structures, as in the above image of mottled tree shadows falling across subtle bands of colored stucco and concrete. 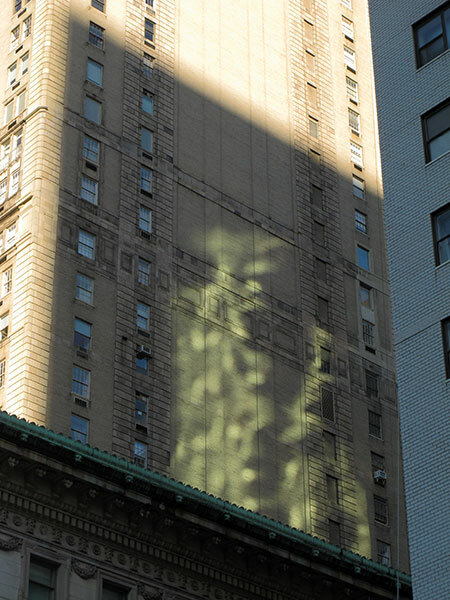 In the picture below, the mottled pattern is light reflected from the windows of another building, a towering projection of fire in the middle of a monolithic shadow. 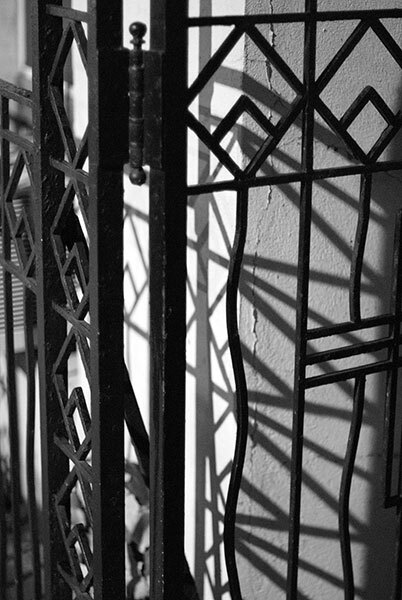 Decorative ironwork makes the stark necessity of security an occasion for creative design, and the visual layering of the black iron and the dark shadows in afternoon sunlight make a complex tessellation. 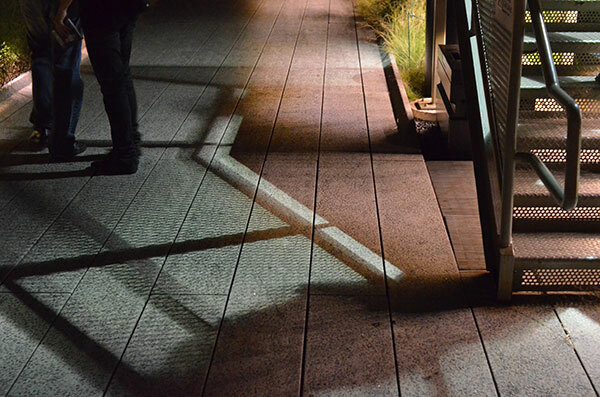 At night, multiple light sources, of different colors, come from different directions, creating subtle patterns. 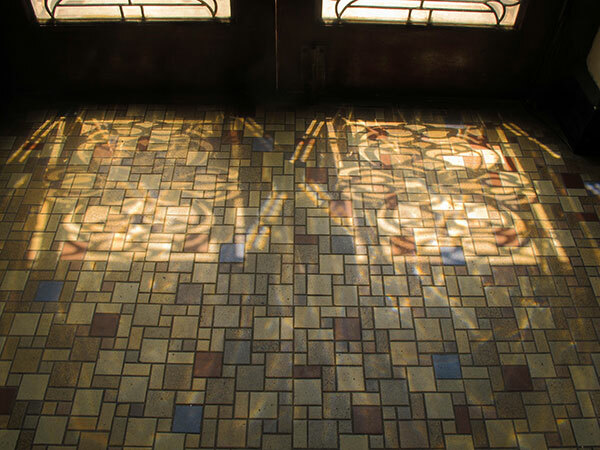 Here, the sun shines through windows of beveled glass onto a tile floor perhaps inspired by Piet Mondrian. A geometrical arrangement in red, beige, and dark gray frames an adumbral totem of modernity. 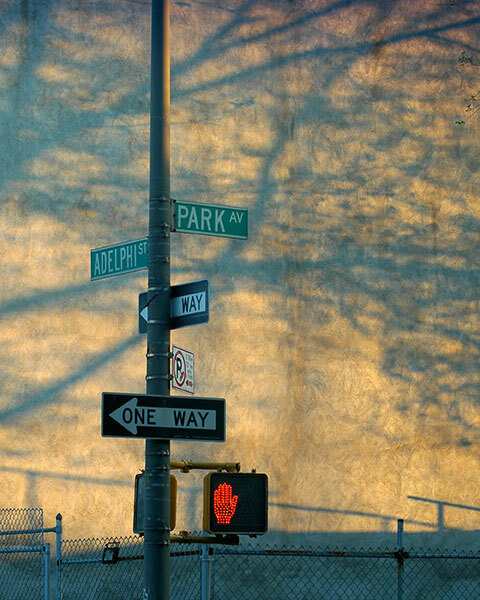 Another signpost is the figure on a ground of stippled gold and teal. 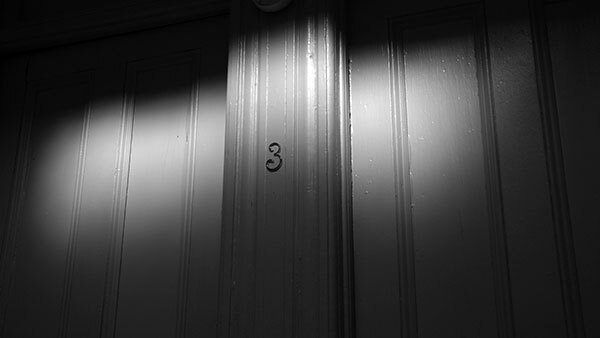 In a shadowy corridor, a beam of light shining through a skylight gives this brass number a soft aura. 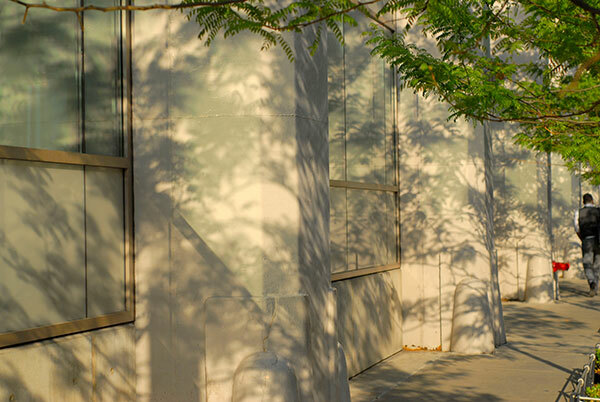 In early morning sunlight, shadows and reflections from chrome architectural fixtures play like wild luminous graffiti across this stodgy corporate structure. I think of this one as a study in polyrhythms, as the different repeating intervals of light and dark, thick and thin, angled and perpendicular, come together. 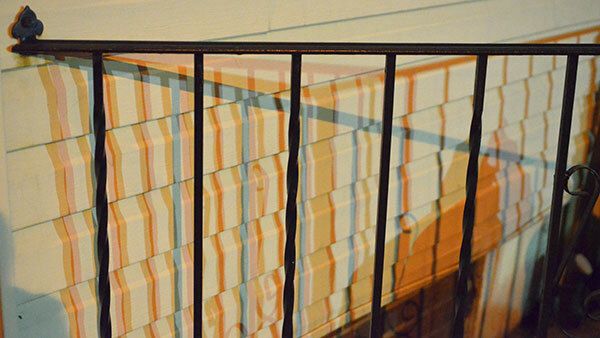 This composition of perspective and piebald is held together by the patch of bright orange netting in the corner. 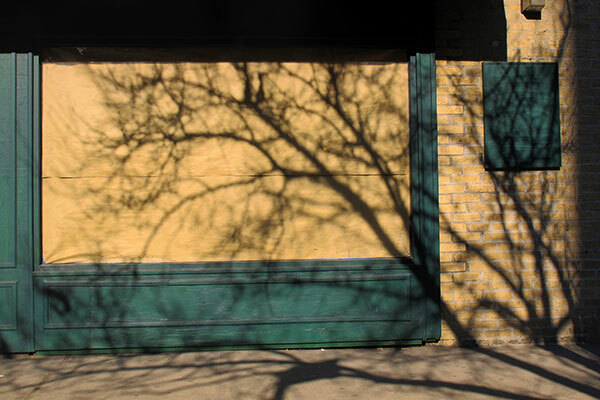 Here, shadows of trees cast directly by the sun overlap shadows cast by the sun bouncing off of greenish glass, a vision worthy of a great abstract colorist like Joan Mitchell. 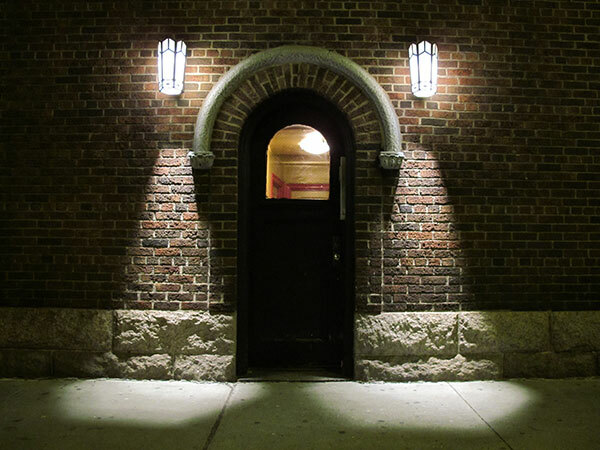 Two lamps cast cones of light like sentries guarding this Romanesque arch. 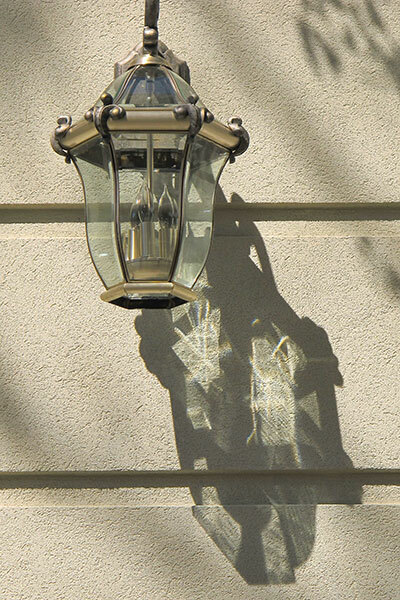 This porch light in the late day sun projects a robotic face on the wall. 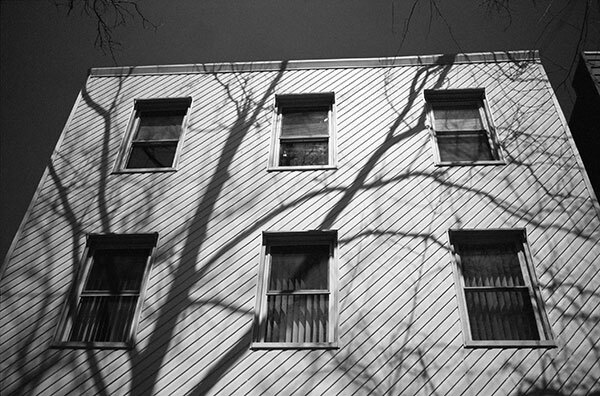 Someone tried to relieve the ennui-producing rigidity of this building façade by putting the vinyl siding on at a 45 degree angle, but the venous shadows of bare trees are what finally do the trick. 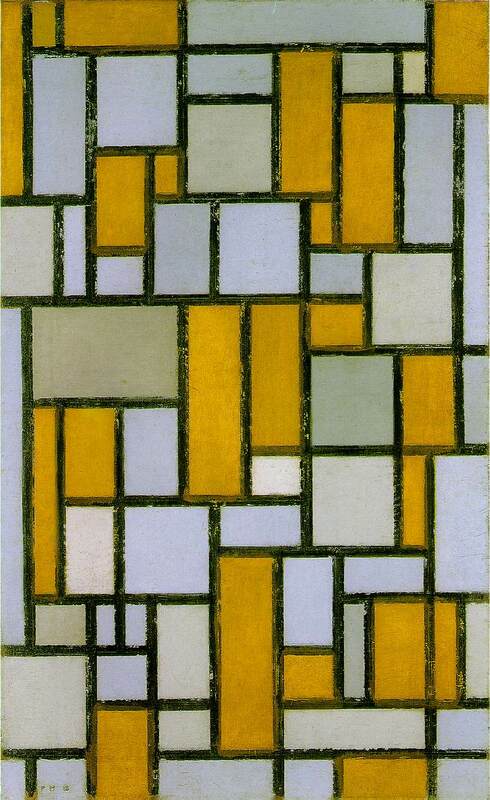 Don’t rectangles and organic branching patterns complement each other wonderfully? 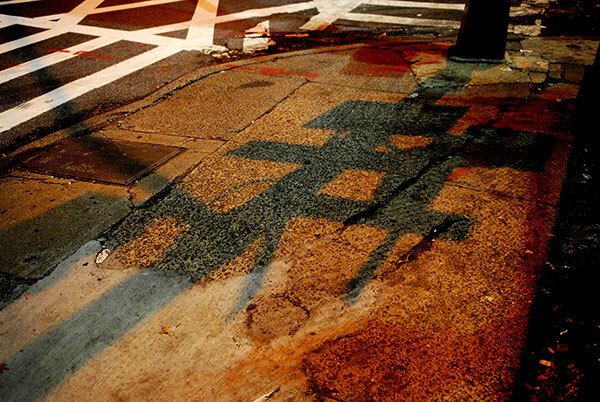 In this nighttime shot, the shadow of a cluster of signs and the crosswalk markings add their jagged geometry to a well-worn street corner. 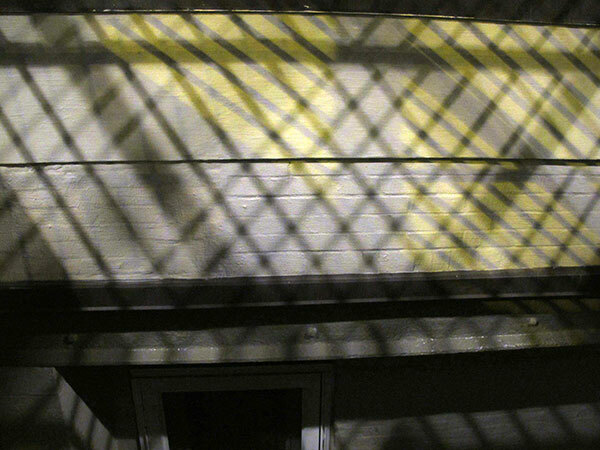 On this wall beneath an iron grating, two white lights and one yellow one create a network of stripes over the masonry. 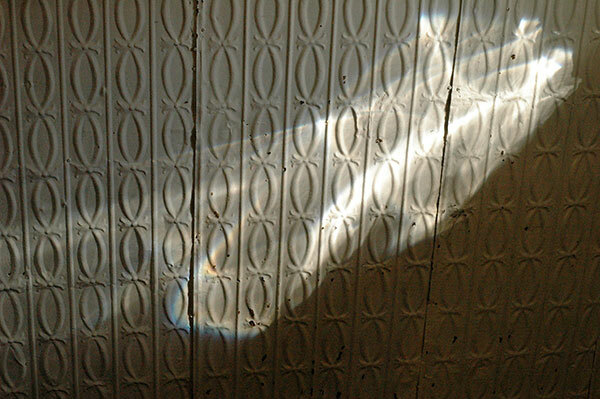 Light reflecting from (I think) a bowl of water in the sun throws this ghost on an old tin ceiling, with a bit of a rainbow forming about the lower left edge. 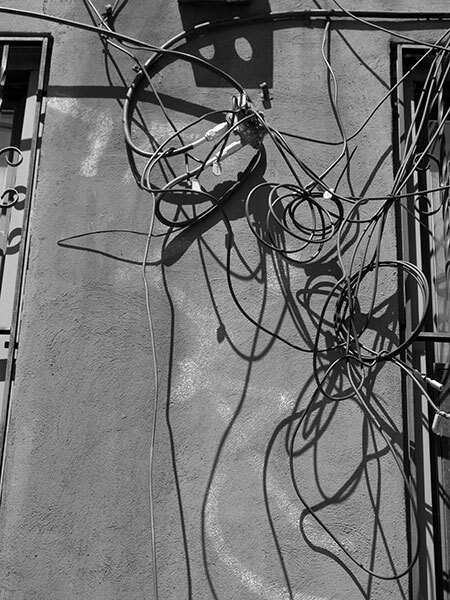 The cable installers never seem much concerned about neatness, and the angled sun turns their tangle into an art brut scrawl. 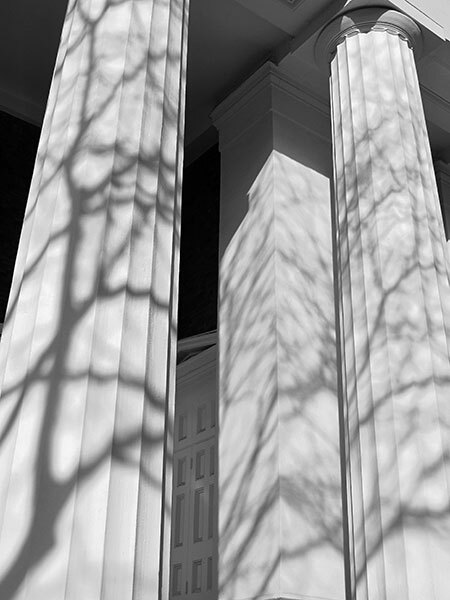 The columns in this neoclassical temple are cast concrete, but sunlight and bare trees give them the veined patterns of Carrara marble. 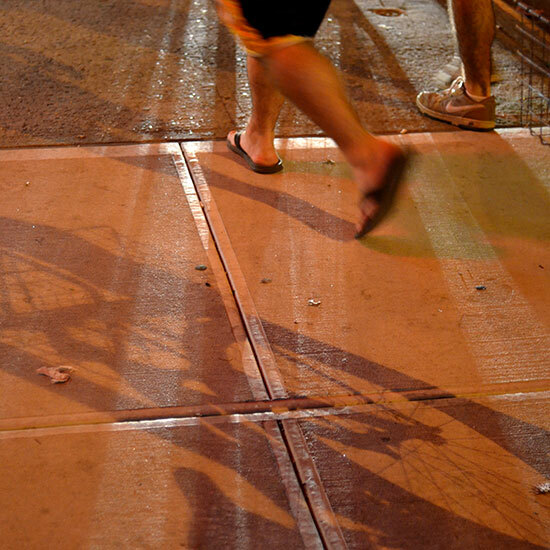 Here the crepuscular rays of a car’s headlights cross the sidewalk slabs from one angle, while the elongated shadow of a bicycle, cast by a sodium-vapor streetlight, cross at another angle. 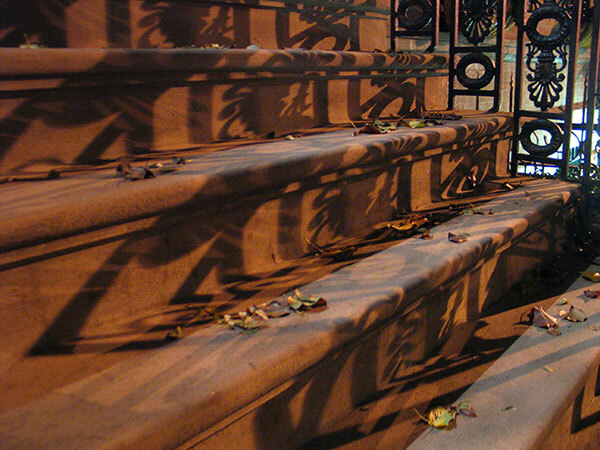 Here the shadows of decorative ironwork dance across the treads and risers of a New York brownstone stoop. 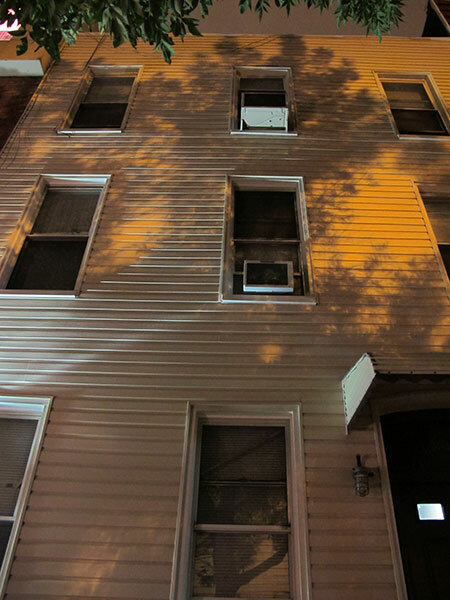 White stripes, orange splotches, dark windows, a looming presence. 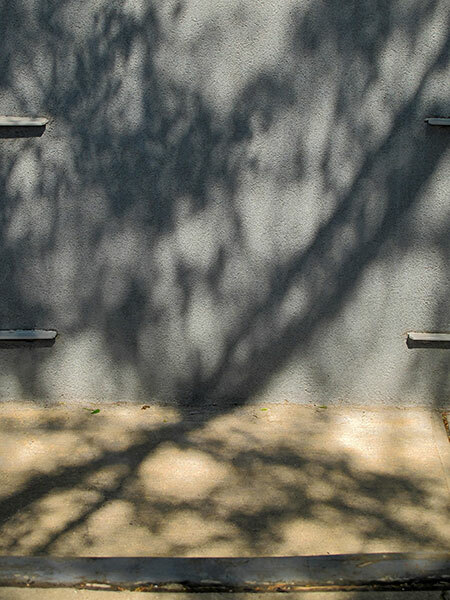 A tree’s narrow leaves make the shadows on this security gate, but it looks like the work of a berserk calligrapher. The sky blue and pink paint on the wall are the colors of baby announcements, but what kind of world are they being born into? 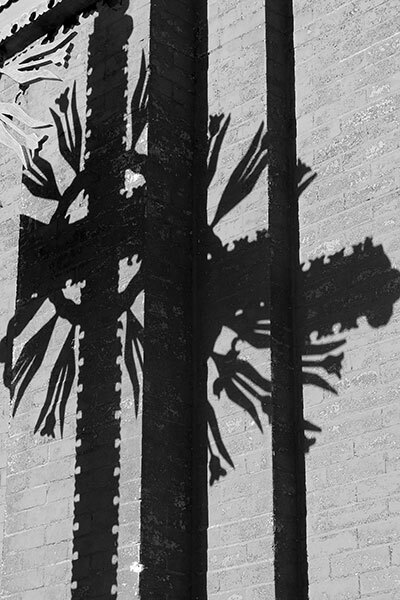 The shadow of an ornate carved wooden cross at a Lithuanian church breaks as it falls across a stepped wall. 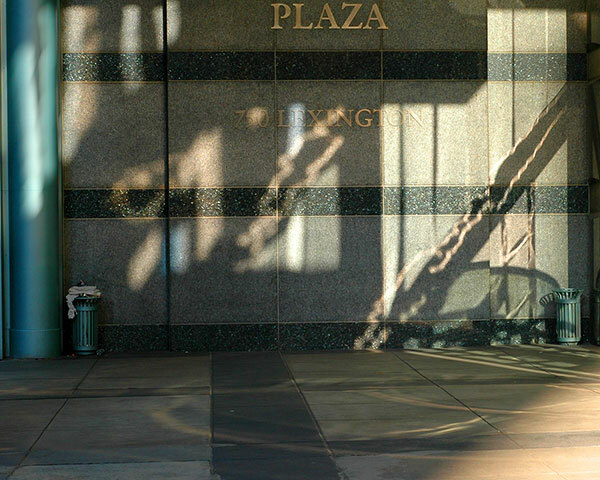 When multiple light sources of different colors cast shadows of a single object, the colors neutralize in the bright areas but intensify in the shadows, especially where light of only one color falls. The city is designed and constructed of plane surfaces, but without the organic forms of trees and people in motion, it would be nothing.